This year our Christmas will be as simple and eco as possible. I'm so fed up with the amount of waste this holiday brings, tired of the shops pushing the idea of 'Your Best Christmas Ever' to get you to buy lots of stuff. I don't want to hear Slade in mid November, it drives me up the wall and I now only go in the supermarket with my headphones on and listen to podcasts to block out bloody Noddy Holder and Wham. And don't even get me started on Christmas Jumper Day.... Over the years we've simplified Christmas in my house - my husband and I haven't exchanged gifts for years (so long ago that I can't even remember the last time we did), we don't send Christmas cards and any gifts to adults I do send are either handmade or edible. I like to make my recipe for Salted Caramel fudge as it's the perfect little gift for teachers, friends or family. I've come to believe that Christmas gifts should be a token, a way of saying thank you or showing a loved one you care. With kids though it's totally different as Christmas feels magical and l wouldn't change that in any way. I loved buying gifts for my son and the utter joy on his face when he was little was the nicest present I could ever wish for. I still make up a little stocking for him every year but sadly the magic has long gone. But I've realised over the years that we're lucky to be in the position of being able to buy gifts. Not everyone is as fortunate and sadly lots of kids are living in poverty and will receive very little this Christmas. I have chosen to gift some toys to Absolute Radio's Mission Christmas appeal, click on the link if you'd like to donate too. I've also gifted some bays of hay to the amazing Hillside Animal Sanctuary who rescue factory farm animals. You can donate here if you are interested. If this all sounds a bit bah humbug to you, then don't be fooled as I do love Christmas. It's simply that I love other things about it than all the crazy gift giving. There is nothing better than curling up with the Radio Times and circling the programmes that I'm going to watch over the festivities, working my way through a lavish portion of sprouts and roasted potatoes, choosing a Christmas tree and then admiring the lights twinkling away on a dark evening. Most of all I love the ritual of sitting down together as a family and watching classic Christmas movies - Elf, Scrooged and National Lampoon's Christmas Vacation. And for the past couple of years we've been celebrating Christmas Eve by embracing the Icelandic tradition of gifting books to one another. The simple things are always the best things I find. This year I've opted to go as eco as possible with our decorations. I couldn't make up my mind about buying a tree and researched what the best option was for the environment. Usually I go with a cut tree, buying it from a local farm and then choosing to recycle it in January. This ranks pretty high up the list of buying responsibly, but I really wanted to do more. So I opted for a pot grown tree which I have re-potted into a lovely vintage galvanised dolly tub which will then go into the garden until next Christmas. I've decorated it really simply using only tiny fairy lights, dried orange slices (how to is here and the oranges smell amazing when they are in the oven) and so I can pretend I'm in my own version of A Christmas Carol, I've bought beeswax tree candles and clips from Freight which I'll light on Christmas Eve. No tinsel in this house thank you very much. Hanging on the wall is my lovely Noel banner from Rastall & Daughters, one of my absolute favourite decorations to bring out every year. I've added lots of candles - soy wax and beeswax ones as I love the scent, the glow and the warmth they give off. If you live in Leeds or are visiting the city do make the time to visit the wonderful Herbology Room at Leeds City Library, a free event based on the magical classes in the Harry Potter books and tied in with the British Library's History Of Magic exhibition. 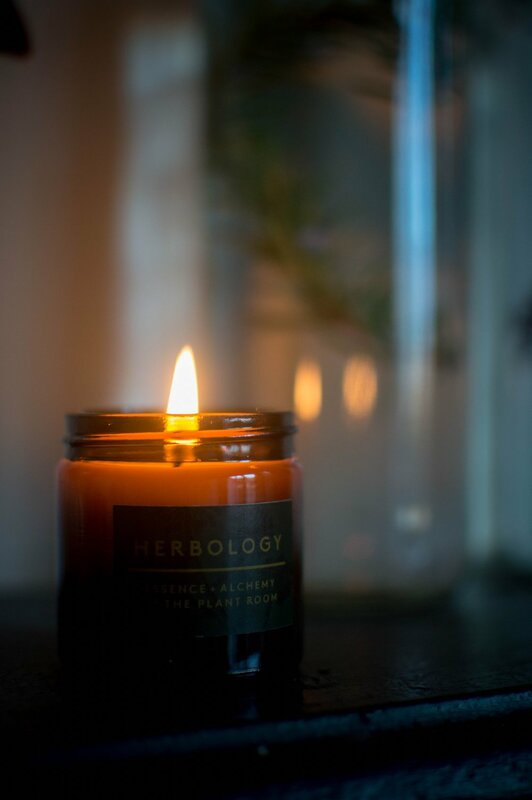 Curated by my friend Zosia of The Plant Room, it's a wonderful place to spend some time immersed in plants, sounds, illustration and a specially created scent by candle maker Essence & Alchemy. I popped along on the opening week when they were also running a series of related workshops including candle pouring with Lesley from Essence & Alchemy and I made my own with the special blend of magical herbs to ward off evil spells and spirits (it smells incredible but sadly the neighbours still live next door, hahaha.....). 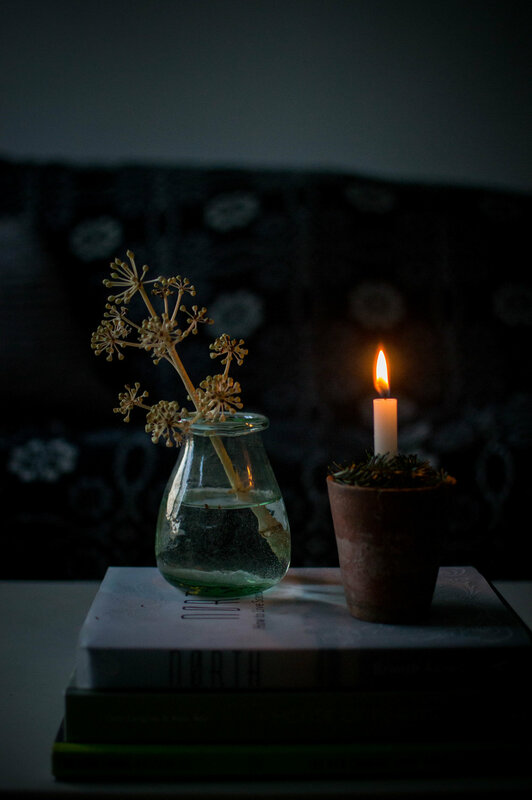 I've also brought in little bits of greenery from the garden and used some trimmings from the tree to turn vintage terracotta pots into candle holders. A couple of weeks ago at the hairdresser I was browsing the interior magazines and stumbled upon a home in Elle Decoration that simply took my breath away although I can't remember for the life of me the owner's name. I'm pretty sure she was South African if anyone can help me out with that! 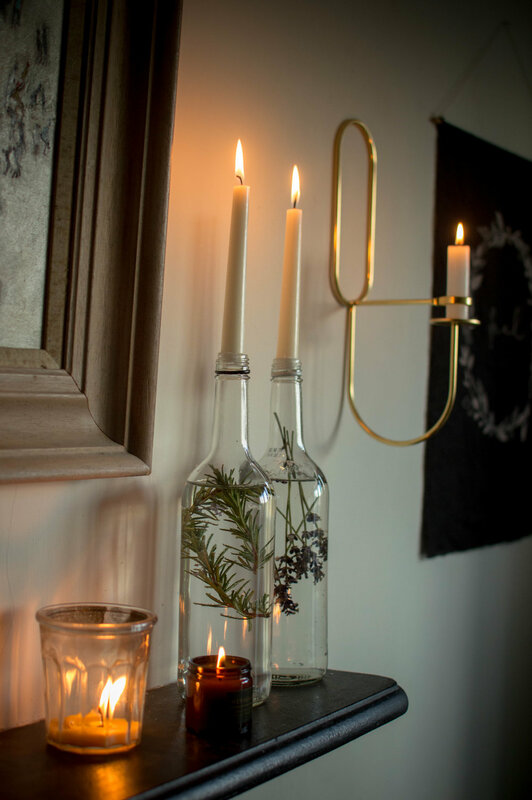 But the things that I loved the most were the natural elements that she brought into her home - simply taking empty glass wine bottles, adding some water (distilled or boiled to stop the discolouration from the greenery), popping some herbs from the garden and topping with a white candle. So simple, so beautiful and completely eco. Not having any clear wine bottles in the recycling I chose to use a couple of cordial bottles instead and put a little rosemary and lavender in them. Hint, put the lavender in upside down otherwise the heads all float to the top and you can't appreciate the colour. I made this rookie error and had to correct it and it's not easy to get the greenery out once in the bottle! Anyhoo, I'm pretty happy with them and I'd like more so I guess that gives me an excuse to drink more wine, ahem. But they would look really lovely on the Christmas dinner table don't you think? If you are looking for some other natural, eco ways to decorate for Christmas then check out my Pinterest board here. And I've also got my bake on this week using seasonal ingredients, this time it's the humble parsnip. I've made different cakes with vegetables before, carrots usually as well as beetroot, squash and courgettes, but never before have I used parsnips. And I'm pleased to say that they turned out great, making this cake utterly delicious, really moist and although you can taste the parsnips a little, it is never off putting. Most people wouldn't even notice they were there. It's the perfect cake to share over the holidays if you are not a fan of Christmas cake, fed up with all the mince pies or if you want to make something as a gift. Have a very Happy Christmas. Thanks for reading. Preheat the oven to 180°C/fan 160°C. Grease and line the base of two 20.5cm sandwich tins with baking paper. In a large bowl sift together the flour, baking powder, cinnamon, nutmeg and mixed spice. Add the caster sugar and sultanas (or chopped walnuts if you are using), mix through with a wooden spoon, and set aside. Put the eggs and sunflower oil in a different bowl, and beat for a few minutes. Now mix all the dry ingredients into the egg and oil mixture, along with the the grated parsnips and orange zest. Mix everything together until you have a thick batter. In a bowl, beat the butter with a wooden spoon then add the cream cheese and icing sugar. Beat until it all comes together, but be careful not to overdo it, or the frosting will become runny. Leave the frosting in the fridge until you need it. Recipe is adapted from Nadiya Hussain.